Cell subscribers sue Verizon Wireless for disabling Bluetooth file transfer: There was word all over the Net that this was brewing, and this report says the suit was filed. 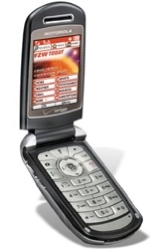 Verizon Wireless disabled Bluetooth file transfer (and possibly other features) on its Motorola v710 phone. The suit alleges, as some online mobile folks have said since this came to light, that Verizon disabled the feature to force its subscribers to transfer photos only through its higher-priced data service offerings. Bluetooth operates at about 700 Kbps of real throughput; Verizon's EVDO network, as cool as it is, can only handle 50 to 100 Kbps upload speeds; slower where there's only 1xRTT available, too. To transfer photos to your computer, you'd need to subscribe to a Verizon data plan and photo plan, transfer the photos, and then download them. So it's a three machine process. The suit may hinge over whether Verizon Wireless misled customers, which it appears prima facie that they did not. As a Motorola spokesperson said, quite amusingly to my ear, "Nobody in the industry has ever said that Bluetooth would always be cost free. It will vary from operator to operator." There is something customers can do about this: buy unlocked phones. Currently there is a work-around available. You can use the TransFlash card slot to copy ringtones and pictures to and from your phone. Rumor has it that Verizon is disabling TransFlash in the next firmware version. Funny, I just refused to buy a v710 for this very reason. The phone only has three Blue Tooth profiles. Headset, Car Adapter and Modem. Even then it wouldn't pair with my headset. It's a data cable and the software to link your phone to a PC. I use it to back up my phone book, keep my calendar up-to-date, pull photos off my phone and put in MP3 files for ringtones. It can do more. The Motorolan was wrong to say that, in two ways. First, Motorola has so far managed to stay on the high road of just providing the platform, not deciding on what restrictions are put on users' rights. This is not Motorola's fight, and if anything they should be expressing views that support the customer. Second, it is wrong that nobody in the industry has ever said bluetooth would be cost free. It has been said many times, and it has been implied, and it has been assumed, and the assumption has not been corrected by anyone in the industry.